A treat is in store with a musical double at St. Nicholas’ Collegiate Church, Galway this week! 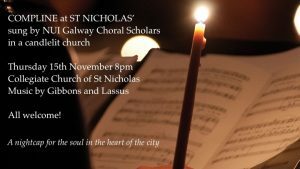 Thursday 15th November sees Compline sung by the NUI Galway Choral Scholars in a candlelit church – while Saturday 17th has one of our regular series of popular Coffee Concerts. 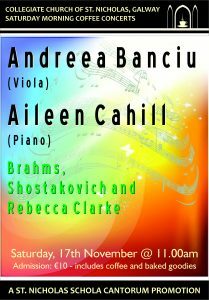 Brahms, Shostakovitch and Rebecca Clarke. A St. Nicholas’ Schola Cantorum promotion.